Among the very few desciples with the ability to integrate, you are a stronger one; that's how I feel you. Please look at the bigger picture. Look at us. You can integrate, you can inspire. Please continue. Behouden to your kids, to your wife, to your life. 'cause I prefer to be the desciple among the desciples, even if in a faraway country. Of the photographers of Guru, you have chosen a poor one: his pictures of Guru are some of the most unflattering ones I have seen. They are often dark and poorly composed. Why not use Ranjit, Unmesh, Pavritrata...and some others who have shown Guru's divinity? I'm at a loss as to the criticism of Prashphutita, whom I don't know. Sounds like something personal to me. His pictures (or hers?) seem perfectly fine to me. I have linked to photos by Ranjit, Unmesh and others throughout the blog. Ultimately, however, I've used this photo for a very particular reason (as I do with most of the photos I've incorporated). Though it may not be obvious to everyone, there's a specific tie between the blog post itself and this picture. I leave it to you (and other readers) to figure out. Free coffee on me for the first commenter to post! "I leave it to you (and other readers) to figure out." It's the goddess Saraswati, well her statue on Guru's table. 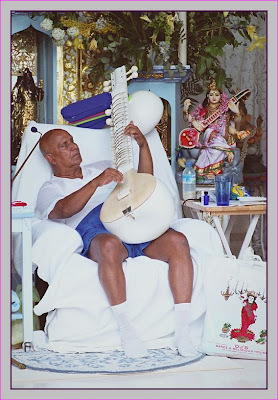 As PeacePP points out, the goddess Saraswati sits on Guru's table in the photo, which I though tied in nicely with our sister disciple, Puerto Rico's own Saraswati. Coffee is definitely on me, though you'll have to email me directly so that we can figure out how you can claim your prize (yogaloy@yahoo.com).